BMW is working on an even hotter version of its i8 hybrid sports car, Auto Express has learned. 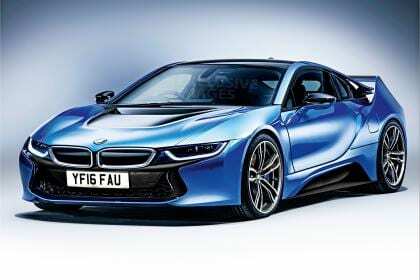 Insiders have confirmed that the higher-performance i8 could be launched as soon as next year, in time to celebrate the firm’s centenary, and our exclusive image shows how it could look. a more modest increase is expected. At present, the i8 is powered by a combination of a turbocharged 1.5-litre three-cylinder petrol engine and an electric motor, with a maximum combined power output of 357bhp and 570Nm of torque. Its official performance figures are 0-62mph in 4.4 seconds and a top speed of 155mph. Extra performance is expected to come from an upgraded petrol engine, not the electric propulsion system. The petrol engine currently makes 228bhp – already quite a stretch for a three-cylinder unit – so BMW is believed to be testing a new configuration using a 2.0-litre four-cylinder petrol engine producing well over 300bhp, taking power to around 450bhp. It is understood that a 0-62mph time of under four seconds is the target. A larger engine will clearly add weight, but BMW will counteract that with unpainted carbon fibre body panels and possibly even a stripped-out two-seat-only interior to try to maintain the i8’s 1,485kg kerbweight. BMW has been monitoring the success of Ferrari and Aston Martin in creating high-priced, low volume special edition vehicles for well heeled enthusiasts and is keen to tap into the market. Hence it is highly likely the new version of the i8 will be given a distinct appearance from the normal car. Our image shows how the makeover could bring wider and lower bodywork, bigger wheels and brakes and an integrated rear wing inspired by the recent BMW 3.0 CSL Hommage concept (above). Whatever form the hot i8 takes, it won’t come under the remit of the M brand, as the company has stated that ‘i’ and ‘M’ will never mix.